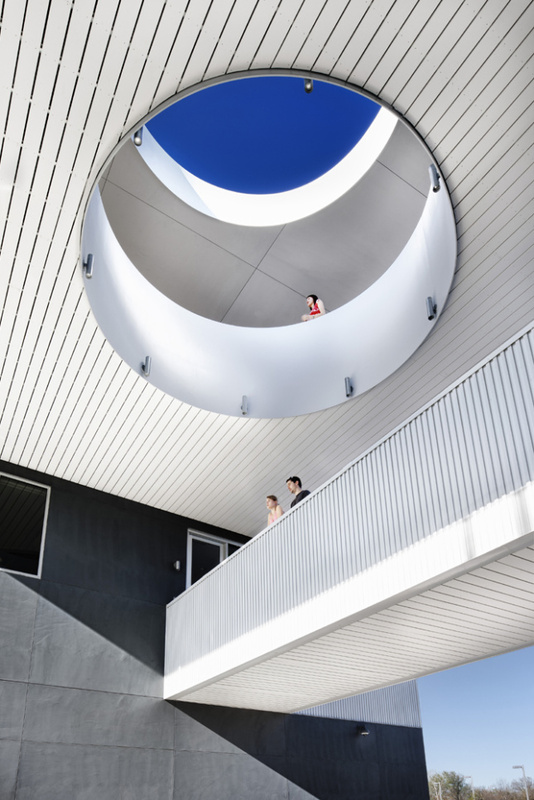 As Austin has become the hippest city in Texas (to the excitement of millennials everywhere), its architectural scene has also become the liveliest, with Miró Rivera Architects, the Texas Society of Architects architecture firm of the year for 2016, as one of its shining stars. The practice began when Juan Miró—born in Barcelona and educated in Madrid—was working for New York City firm Gwathmey Siegel Kaufman Architects, and was dispatched to Austin to oversee construction of an opulent villa commissioned by personal computer magnate Michael Dell. When the Dell House was completed in 1997, Miró realized he preferred the sunny Hill Country—with its passably Mediterranean climate—to Manhattan. Much like another émigré, the Viennese architect, Rudolf Schindler, who was sent to Los Angeles in 1920 by his boss, Frank Lloyd Wright, to keep tabs on a then-under-construction mansion for oil-heiress Aline Barnsdall, Miró decided to go out on his own afterward using the connections from the Dell House to get commissions (and crucially at first, also to get a steady teaching gig at the UT School of Architecture). Three years later, he was able to coax his Puertorriqueño brother-in-law, and fellow Gwathmey Siegel alum, architect Miguel Rivera, to join him and the firm was officially established in 2000. As would be expected from a firm begun by transplants with such sophisticated pedigrees, the approach is decidedly cosmopolitan. 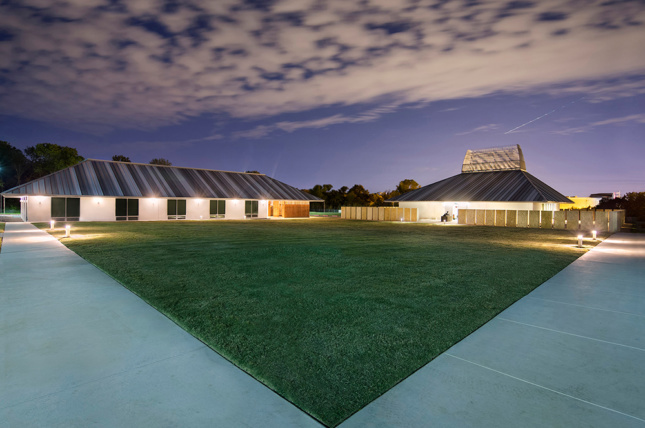 This contrasts in an interesting way with the typical emphasis on formal regionalism espoused by the best-known modern architects in Texas, like O’Neil Ford and his spiritual descendants, Lake|Flato. These regionalists take inspiration from pre-industrial, rural buildings and tend to use specific local materials like limestone and brick. Miró Rivera’s projects, with their markedly varied, but always starkly modern appearances, appear almost to be the work of multiple firms, much like the multi-faceted Eero Saarinen. According to Rivera, the firm seeks to create an architectural vocabulary or iconography drawing from a variety of sources specific to the requirements of each commission. In this way, each project gets its own identity, but through the same analytic process, and through this dialectical exercise, the local becomes cosmopolitan. 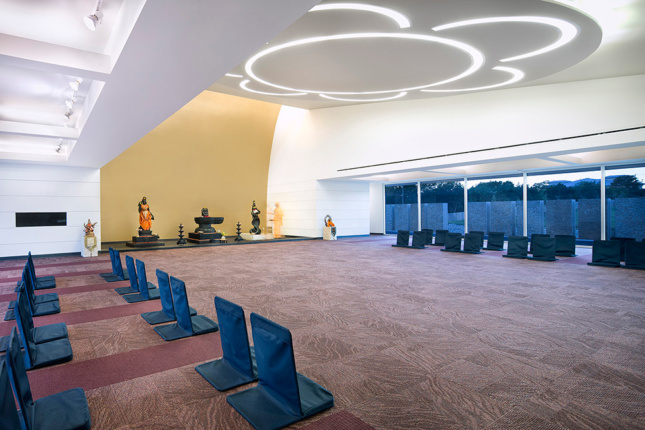 An educational center and worship space for a Hindu spiritual organization is an unusual program for central Texas—not known for accommodating a large South Asian immigrant population. Although strict budget constraints precluded the traditional stone temple the clients initially hoped for, the architects were able to devise a vocabulary of forms that could be built of inexpensive materials, but still recall typical Indian architectural typologies specific to the school and temple. 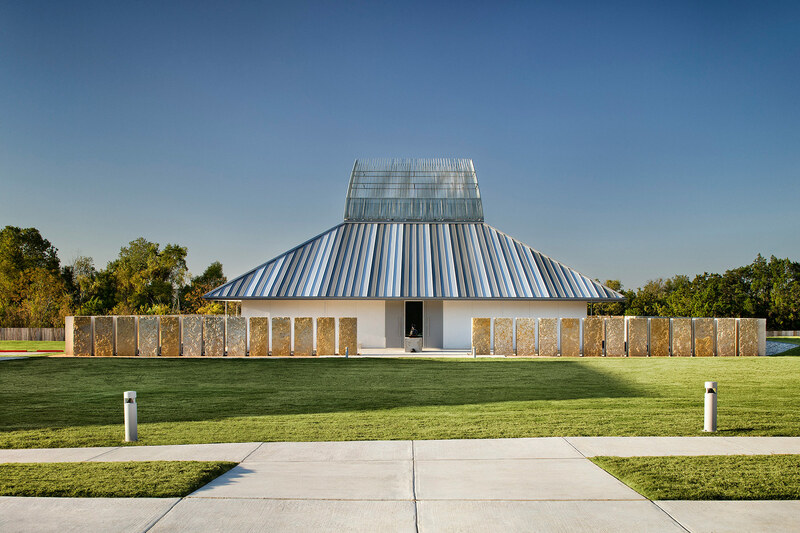 Simple strategies, like alternating the colors of the metal roof panels and building a stone precinct wall of limestone slabs that could be individually sponsored as part of the fundraising effort, combined pragmatism and poetry. 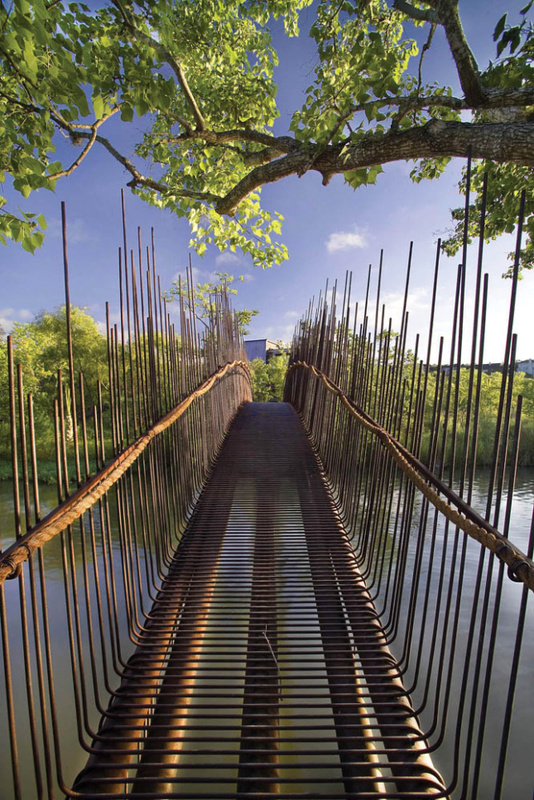 This bridge connects the main house on a property facing Lake Austin to a separate guesthouse. Its structure is made of several 80-foot-long, 5-inch diameter welded steel tubes that arc gracefully over a watery inlet separating the two buildings. The deck and sides of the bridge are made of half-inch steel rebar wrapped around the tubes. 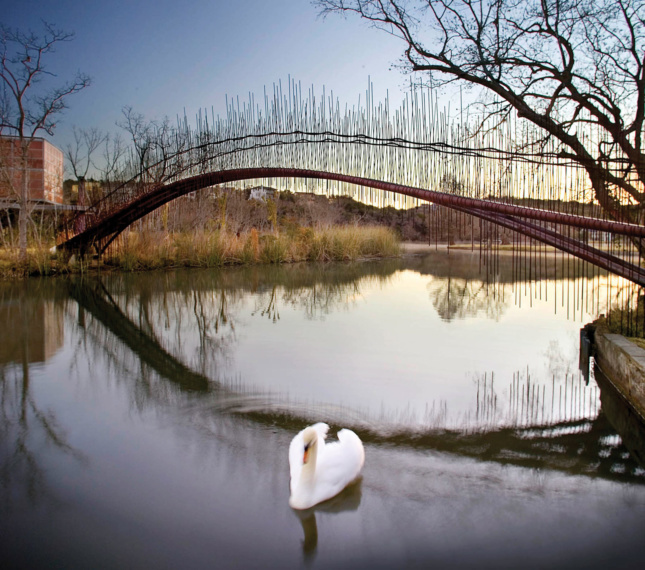 These common elements combined in an unexpected way evoke wetland plants growing on the site and transform what could be an intrusive element into a symbiotic, almost invisible link. 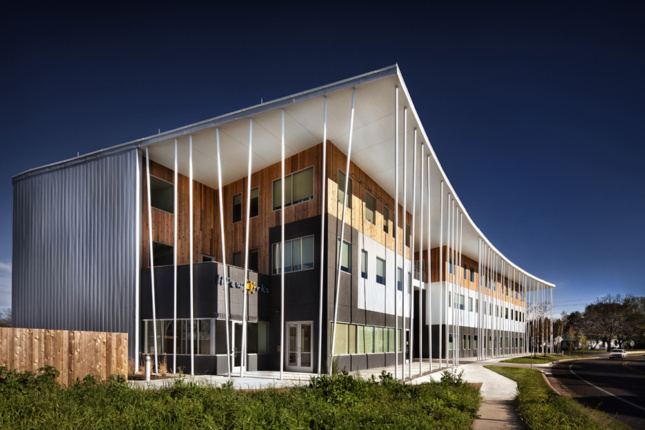 This headquarters was built for a nonprofit organization that helps at-risk children and families reorient their lives through educational programs and counseling. The architects physically suggested the organization’s mission by orienting it outward and opening it up to the neighborhood. The building is aligned to the edge of its site along a curving street with parking set to the rear. A continuous, three-story colonnade runs along this front-facing elevation. Its columns are slightly askew, an oblique reference to the organization’s clients, who come seeking support and assistance.Another design element doing double duty is the mix of three different exterior cladding materials, which alludes to the organization’s three cornerstones: counseling, education, and youth development. 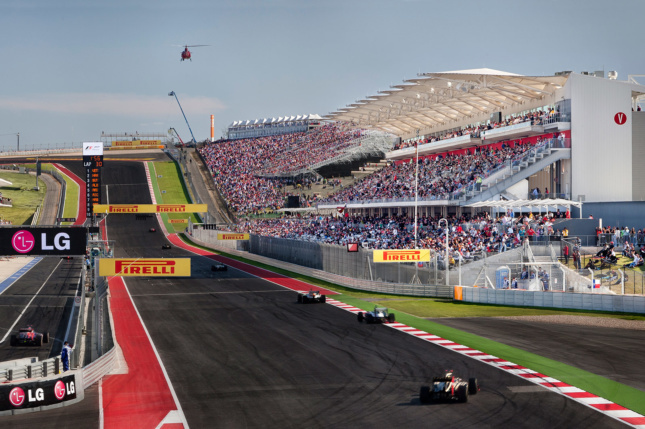 The 1,500-acre Circuit of the Americas, just outside Austin, is the first purpose-built Formula 1 racing facility in the United States. 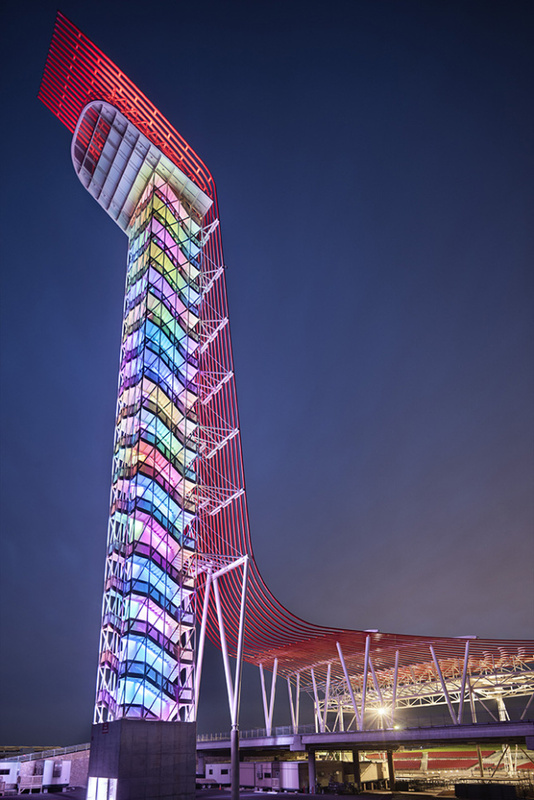 For this project, the architects were commissioned to design a 9,000-seat main grandstand, a 27-acre Grand Plaza, a central greenspace with a 14,000-seat outdoor amphitheater, and a 251-foot-tall observation tower. (A specialist German firm designed the super curvy track itself.) Naturally, the team looked to cars and auto culture for formal design cues. This is perhaps most clearly expressed in the band of sinuous red pipes shrouding the observation tower, the most prominent element on the site. According to Rivera, the idea for them came from watching the endless taillights of cars in the evening commute on the notoriously crowded Austin freeways winding their way through the city.